On Tuesday, Nikon finally released the long-lost update to Nikon Capture NX 2, Nikon’s software for editing raw images captured with its digital cameras. Now called Capture NX-D, it is in public beta and available for download from Nikon. Once finalized, the application will replace Capture NX 2. In other words, Nikon is setting Capture NX users free or, as some feel, abandoning them. New cameras will not be supported and there will be no more updates for new operating systems or to fix bugs. More importantly, however, is NX-D will not support edits previously applied to images in Capture NX 2 because of two changes. First, Nikon is updating how it stores edits to an image. In NX 2 and earlier, edits were saved in in the raw file. With NX-D, Nikon will store edits in a sidecar file as is done by Photoshop and Lightroom (if you are writing edits to XMP). Second, NX-D is losing what made NX 2 exceptional and so attractive: Control Points. They allow you to apply adjustments to specific areas of an image rather than globally without having to create complicated masks as in Photoshop. Transition to Lightroom or an all Photoshop workflow. (Don’t go to Aperture; it looks like it will have the same fate as Capture). The problem with the first option is that you are simply delaying the inevitable. A system update or a new camera will eventually force you to make the transition to a new workflow. The only real option is to make a change. Select a new editing application. My recommendation is Lightroom. It is available for Windows and Mac; it is widely supported by third-party plugin developers; and really is a complete workflow in one application. If you are careful in the field and get a decently exposed image, it is all the editing application that you will need for most of your images. 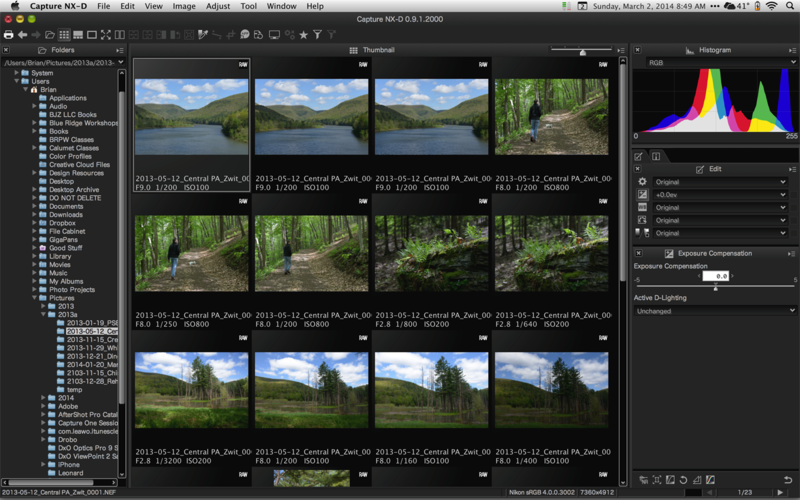 Export all the images that you have edited in Capture NX 2 as 16-bit TIFFs. While you won’t be able to change any of the original edits, you will preserve the image as edited in Capture NX 2. Import all the original raw images into Lightroom or whatever program you choose as your primary editor if necessary. This leaves you with two copies of some images. The original raw image that you can edit in Lightroom and the TIFF, which has all your edits from Capture NX 2. The TIFF can, of course, be further edited in Lightroom. This is not an ideal solution but it is a solution and probably easier and cheaper than maintaining a computer forever with a current version of Windows or Mac and Capture NX 2. Postscript: My comments should not be read as criticism of Nikon. Nikon had a tough decision to make regarding Capture NX 2; it was time to update the software or just drop the software. I think that Nikon made the right decisions. It choose to create a replacement, use sidecar files to save edits, which is the standard method today for storing edits, and to drop control point technology. This last decision was the most upsetting to me because the control point technology is what made Capture NX stand out from the competition. However, it may have been dropped simply because it was not possible to use the technology any longer due to licensing issues. What is happening here will happen again. When it comes to technology, change is unrelenting. This is why I believe in standards, such as the DNG format. Standards mean more than one company can support the same technology. Editor’s Note: The School of Creative Photography will be offering its intensive one and a half day Lightroom course on May 3 and 4. It covers the most important portions of the application and will provide you with a complete background from which to starting using Lightroom to process your images. 01 Mar	This entry was written by School of Creative Photography and published on March 1, 2014 at 10:17 pm. It’s filed under Editing Images and tagged capture nx, lightroom. Bookmark the permalink. Follow any comments here with the RSS feed for this post.